What makes Jair “God above everything” Bolsonaro a far-right politician? Those stupid people have gone and done it again. Not content with Brexit, Trump and Orbán, or the rise of the National Front, Alternative for Germany, Golden Dawn or the Lega Nord, the anti-globalist far-right populists have now taken over Brazil. 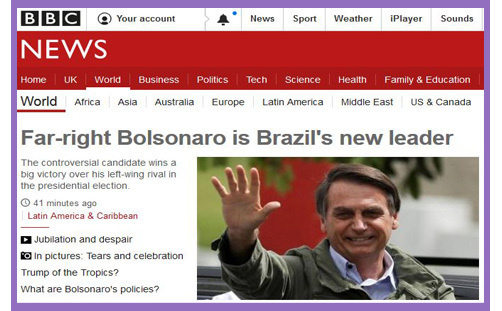 “Far-right Bolsonaro is Brazil’s new leader”, bleats the BBC, as though Jair Bolsonaro had stolen a nation from the enlightened divine-right rule of the “left-wing Workers’ Party”. For the BBC, there was nothing ‘far-left’ about the corruption, crime, economic meltdown, widespread poverty, hunger and homelessness induced by the ‘social policies’ of former president Luiz Inácio Lula da Silva (who is currently serving 12 years for money-laundering). Even when Lula was called one of the most popular politicians in the history of Brazil, and even the most popular on earth, he still wasn’t sufficiently popular to be classified by the BBC as ‘populist’. That sort of thing doesn’t go down very well at the BBC. Now, to be fair, Bolsonaro has also said some quite outrageous things, but.. well, so have Jeremy Corbyn and John McDonnell, but the BBC doesn’t classify them as being ‘far-left’ for having done so. Can’t a man back-track, retract and change his mind? Or is it only the left that can do that, while the right are indelibly stained with Hitler? Campaign rhetoric aside (if one may do that) what makes Bolsonaro ‘far-right’ as far as the BBC is concerned are his pro-life, anti-secularism, pro-military, anti-genderism, pro-defence, anti-establishment, pro-marriage, anti-immigration, pro-market, anti-statist views, which, for quite a few people, chime with those of traditional right-wing conservatism. Indeed, Jair Bolsonaro has himself insisted that he isn’t ‘far-right’; simply ‘right-wing’ (..of course he would..), and he has enormous support in this from the country’s millions of Protestant Evangelicals and Roman Catholics (or are they, too, far-right?). Right-wing.. far-right.. for the BBC (and the Guardian) these terms pretty much amount to the same thing: if you support Brexit, Trump and Orbán, you are ‘far-right’. It’s more or less what CofE Bishops believe. There is no apparent understanding that Brexit, Trump, Orbán and Bolsonaro haven’t come out of nowhere: they are the spiritual children of liberty. People voted for them because they wanted justice and accountability: they wanted jobs, food, housing and security. They wanted change, hope, a feeling of being in control of their fate. Brazil’s murder rate reached 63,880 last year, which is twice the number in the United States and the European Union combined. Why should people live with that terror? Indeed, what kind of life is it supposed to be? Wouldn’t you vote for an agent of change if your streets were awash with the headless corpses of defaulting drug dealers? If the left-wing and centre-left and centre-right and ‘Third Way’ aren’t capable of satisfying basic human needs, it ought to come as no surprise that people swing to the right. Which you may term ‘far-right’. If you do, you most likely object to the revival of right-wing conservatism as a governmental force and a body of political thought altogether, and the ‘far-right’ smear is your method of delegitimisation. Whether it’s the New Right or neo-liberalism or Capitalism or Thatcherism, it is all basically ‘far-right’ because it is ‘extreme’ and hurts the poor and discriminates against migrants and minorities. If you love your nation, you’re a nationalist and ‘far-right’. If you favour your indigenous ancestry, you’re a racist and ‘far-right’. If you prefer the shared memories, myths and symbols of your Christian culture, you’re a xenophobe and ‘far-right’. If you incline toward tradition in sexual morality and doctrinal continuity, you’re a homophobe and ‘far-right’; And if you favour political liberty in the framework of religion, you’re basically a theocratic fascist; a breath away from the Nazi ideology of Christianity syncretised with nationalism. At least according to the political and social-science understanding of the BBC. And so, rather like the episcopal view of Trump and Brexit, the ‘real’ Christian must eschew such ‘extremes’ and resist the Bolsonaro regime, witnessing prophetically against his factional zeal and pretensions to godly authority. If you don’t, you become participant in the hate; an advocate of sadistic intolerance and violence against synagogues; a murderer of Jews at prayer. To be ‘far-right’ is to be ‘evil’: the election of Bolsonaro is a violation of the new world order of peace and global enlightenment. Although he was democratically elected with the support of tens of millions of Brazilian Christians, the ultra-enlightened tell us he is a sectarian zealot: ‘tough on crime’ means the mass murder of guilty and innocent alike. Honestly, isn’t it worth suspending democracy, limiting liberty, and curtailing the freedoms of religion, speech, expression and assembly, in order to preserve the BBC’s ‘higher’ values?